As I mentioned in the last posting, our brush with Cyclone Anais turned out to be a non-event, but just about when we were no longer worrying about that we were starting to approach the southern tip of Madagascar and head to start thinking about the complications of getting to Richards Bay, South Africa. While you can get a pasting anywhere from Mauritius to South Africa, the really dangerous part of the passage is just off the coast of SA where you have to cross the south-flowing Agulhas Current which is the most powerful ocean current in the world. When frontal systems pass over the area of the current they bring a day or two of strong south westerly winds, called 'busters' that tend to produce huge, steep, often breaking waves, which as the cruising guide says reach 20 m and more. These waves are not just uncomfortable they can be deadly so at all costs you must stay out of the current when there is a buster. The problem is timing your passage from Madagascar so that you arrive near the SA coast at the right time (the period between low pressure areas passing ranges from 2 days to a week or so. A secondary problem is how close to pass the southern tip of Madagascar since there are seamounts there that can cause nasty waves when the winds get up. Some books say you should stay 200 miles offshore, others 100 miles, while others just say you should avoid the seamounts. We started aiming 150 miles south and gradually crept closer we found ourselves in a foul current that was close to three knots - and this in a location that should have had a favourable current of about a knot according to the Pilot Chart.. The Peri-Peri Net was suggesting that the timing was not right for getting near the coast and we considered anchoring in a bay in SE Madagascar to await developments, but the system coming looked to have southerly winds rather than SW and the bay look open to the south so we kept going. Similarly we considered heading to a bay in SW Madagascar where about a dozen boats went to anchor, but the conditions did not look bad at all so again we kept going. Some of the anchored boats waited for almost two weeks for a weather window and still ended up with 40 knots plus on their crossing of the Mozambique Channel. Our plan was to head at least half way across the Channel and then either go for coast or kill time (perhaps by heaving-to) to await a wind change. It turned out to be the former as the PPNet was suggesting that there was a window if we could average something like 6.5 knots for 48 hours - although the window turned out to be shorter than expected - but that was OK because we were able to go faster than that. Our tactic of keeping going worked out just fine. We had a lot of winds in the 25 to 35 knots range but only a few hours with gusts higher than that. 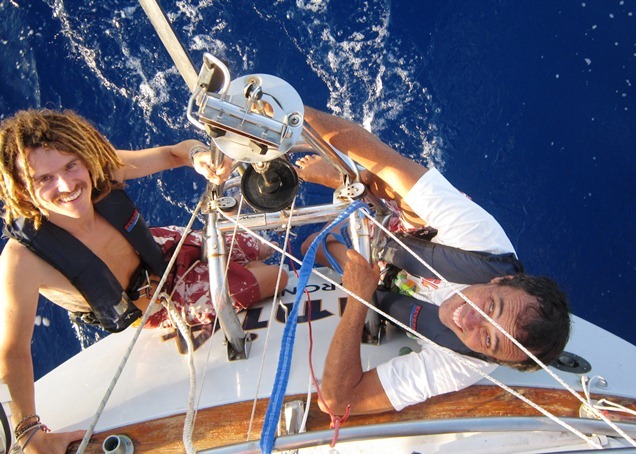 For this part of the ocean that is considered good going since most boats had winds over 40 knots and we talked to one catamaran that laid to its sea anchor for two days with waves breaking onto the foredeck. I can't imagine what this coast must be like in the winter. The last 11 hours of our passage are worthy of mention. I came on watch at 0300 when it was blowing in the low 30s and as dark as the inside of a cow. About three minutes into the watch a wave landed in my lap (have I mentioned that my foulies leak?) which certainly finished the waking up process. Shortly after this it started to pour which at least replaced the salt water with fresh. About 0530 the wind came up with gusts to more than 40 and steady winds in the 35 to 38 knot range. We had to reef even more and this was harder than normal since our furling line was badly chafed so only the core was there. As a result we had tied off the drums at the bow with another line. Kristian went forward to release and retie this line after we furled down to about 60% with virtually no main on a broad reach. Needless to say he had an opportunity to get fully awake with waves landing on him. Through all this I am thinking - is this really fun? Then it all changed, the sun came up and we could see the coast of Africa (the coast of Africa, how cool is that?) 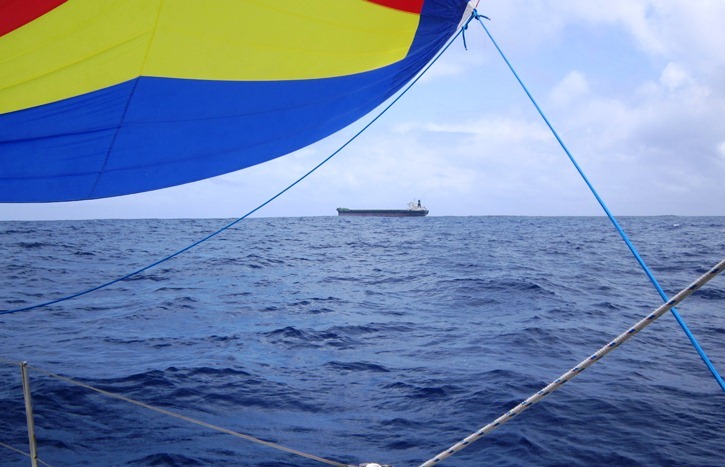 as we had aimed well north of Richards Bay because we had been told not to miss to the south and the weather window would not have lasted until we got to Durban 80 miles to the SW. We had probably the nicest sail I have ever had (40+ years).. IT was still blowing in the high 20s and he had a good current helping us. 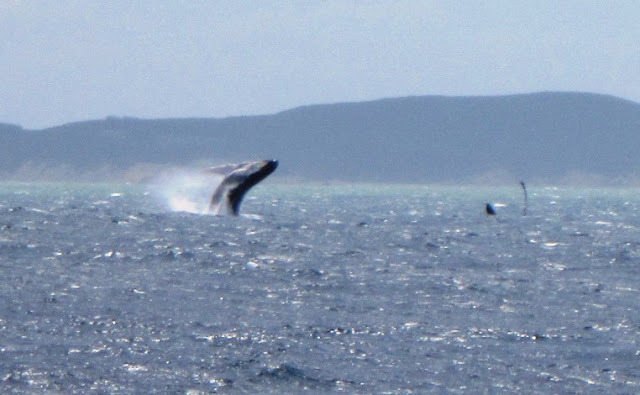 Our speed over the ground was 8+ to 9+ and we saw whales (see pics below) and lovely seabirds. It was magical. BTW, in preparation for this part of the trip we made our heavy weather preps. We had the inner stay set with its staysail. Also, we had our storm trysail in a bag on deck ready to go in its own mast track. Below, we had our parachute anchor and all its gear set up as per the Pardey's storm tactics book ready to go. We were happy to say that it stayed where it started on the cabin floor behind the dining table. There is a lot of traffic in the waters between Mauritius and Richards Bay. Some is going from Asia around the Cape of Good Hope, but a surprising amount is going to and from Richards Bay which is South Africa's most important port for bulk cargoes. This photo was taken SE of Madagascar before the wind picked up. Later on we certainly did not need the asymmetric. This bulk carrier was more than 1000 feet long. Such immense ships are becoming pretty common in some parts of the ocean. Back over the stern for another Morley repair. We noticed we were not steering very well and when we checked we found that the rudder blade on the Monitor had fallen off and was being towed along by the line used to pivot it up when the Monitor is not in use. The pivot pin had broken, likely because the holes on either side of its mounting had worn over the years and rudder could move back and forth a bit putting great stress on the pin. It was easier to install a new pin with extra hands available although it would be doable with just one person. The Monitor bits are now being reinforced in South Africa and I will talk to the Monitor people in California because I checked with other owners and they have had similar issues. On our last morning before arriving in Richards Bay we passed two pods of whales. 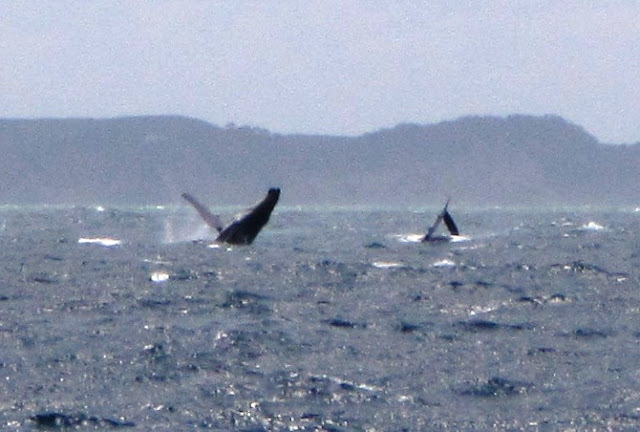 These are humpbacks who were playing (or mating) on the surface. It was incredible to watch. Posted by Bruce at 10:52 a.m.
December 2, 2012 at 5:04 p.m.
We tend not to be as much in touch as some cruisers.It is nice to get away from it all and get the solitude at times. We use SSB and have set up informal boat nets, especially when operating in less travelled places. The one we had from Galapagos to Easter was terrific and we were able to help a young single-hander who might not have been able to fix her boat and get to the island. We have a Pactor modem that a friend brought to Ecuador but we have had considerable trouble getting it to work. Will be trying again in Port Elizabeth or Cape Town when we can get a technician to do some radio mods. We use weather faxes because I like to see the big picture of fronts and the like. Really weather forecasts are of most benefit when it comes to making the decision to leave somewhere. If you are on a long passage you are out there for much longer than the duration of any forecast so you just take the weather as it comes. In tropical and semi-tropical areas this works well. Weather nets, like Peri-Peri, Herb and Chris Parker are helpful because the people involved have so much experience in the areas that they cover so they can go way beyond a GRIB or even a weather map. December 3, 2012 at 12:42 a.m. Thanks for all the great info. Enjoy Christmas in Cape Town. Best for the new year. December 11, 2012 at 8:30 a.m.